Description: Circular gilt bronze and enamel order with the points of a cross flory, on integral imperial Ethiopian crown suspension; the face with a trilobe central medallion divided by a Trinity cross and bearing in enamels God the Father (top), God the Son (left) and God the Holy Spirit (right) encircled by a gilt ring with an Amharic inscription; the reverse plain and inscribed �MAPPIN&WEBB Ltd�; on original ribbon mounted for wear. The Order was established in five grades in 1930 by Emperor Haile Selassie I for his coronation and its award was initially to a very small group of the aristocracy, high-ranking churchmen and senior members of the Imperial Court. 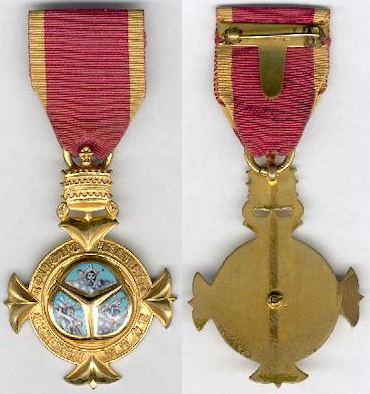 Later it was awarded for outstanding service to the Throne, both civil and military and was not restricted to Ethiopian citizens.